No fruit says Thanksgiving quite the way a cranberry does. Along with blueberries and the concord grape, the cranberry is one of only three fruits native to North America. Originally called a "craneberry" because the blossoms of the plant resembled the head and bill of a Sandhill crane, this tart little red fruit was a staple for Native Americans. 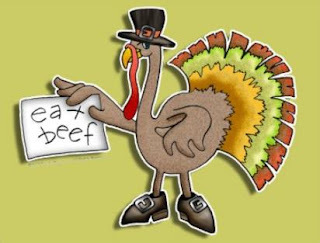 It was used in a variety of foods and was an essential element in pemmican , a high protein combination of crushed cranberries, dried deer meat and melted fat. It was also used as a medicine to treat arrow wounds and it provided a deep red dye for rugs and blankets. 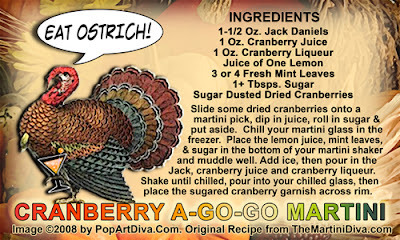 For most Americans the Thanksgiving table is not complete without some form of cranberry dish and now, with the CRANBERRY A-GO-GO MARTINI, we have one more way to serve up this truly American treat to our holiday guests! Even though I'm traditionally a vodka drinker, I really enjoy this whiskey based martini. I love cranberry and Jack Daniels together. I usually use Clear Creek Cranberry Liqueur from Oregon in this recipe but this year I tinkered with a homemade recipe for making my own Cranberry Liqueur. The result was wonderful and I'll be posting the recipe for my homemade Cranberry Liqueur as well as a couple of new Thanksgiving cocktail recipes before next Thursday so stay tuned!